Rick here, and I want to let you all know the band has a new record coming out Sept 16th called The Electric Pinecones! Strange name, I know, but it has to do with an old side project we had called “The Pinecones”. The Pinecones was our “country pysch garage band”, or our excuse to indulge our musical crush on everything from the Seeds and the Byrds to Buck Owens and Ricky Nelson. The Pinecones never went anywhere but practices and maybe a few parties with friends – though I do recall The Pinecones opening a couple local SCOTS shows (yes – we were our own support band at times). But, when it came time to start recording a new SCOTS album I found myself thinking about our old alter ego and how much fun we had playing those tunes and The Pinecones became ground zero for this new record. I hope you all enjoy listening to it as much as we did making it. Hope to see ya on the road this fall. Keep an eye on the tour dates and theofficial SCOTS facebook page for more shows coming up later, too. We’ll bring the chicken and you bring your dancin’ shoes!! 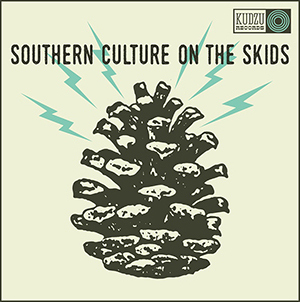 Posted in SongoftheDay, soundtracks, South Carolina, Southern Culture on the Skids, southern rock and tagged dave hart, Mary Huff, Rick Miller, SCOTS, Southern Culture on the Skids, the electric pinecones. Bookmark the permalink.